Transition to an unfamiliar environment is a complex process. Many previous studies have paid more attention to international students' sociocultural adaptation than their basic living conditions and healthy behaviours. In fact, these factors are also closely associated with international students' physical and psychological wellbeing. 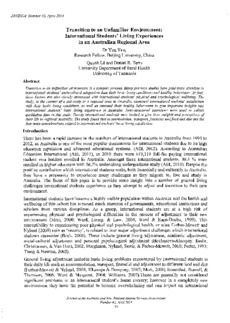 The study, in the context of a university in a regional area in Australia, examined international students' satisfaction with their basic living conditions, as well as assessed their healthy behaviours to give important insights into international students' basic living experience in Australia. Semi-structured interviews were used to collect qualitative data in this study. Twenty international students were invited to give their insights and perceptions of their life in regional Australia. The study found that accommodation, transport, financial and food and diet are the four main considerations related to international students' basic living satisfaction.